Today it was really brought home to me just how amazing this experience has been from beginning to end. The process of writing was the most explicit creative outlet I’ve been able to utilize for some time and it was a kind of revelation to finally get it out and then release it to the public. The editing was a grueling process, but I am so lucky to have the supportive, wonderful people in my life that I do. My editor gave so much of her time to this project and continues to do so by supporting me, offering advice and assistance and even going so far as to plan and execute a book signing/launch party this Friday night. I’m so thankful to have her. My cover art was also created by a friend who took the time out of her day to sit down and work on a piece for my book. Without her artwork, I would’ve wound up photoshopping something myself and let me put it this way… I don’t know how to use photoshop, need I say more? I recently sent out a press release and had the outstanding luck of having an article in The El Dorado Springs Sun newspaper which is the local paper in the town I went to high school where a lot of my family still resides. 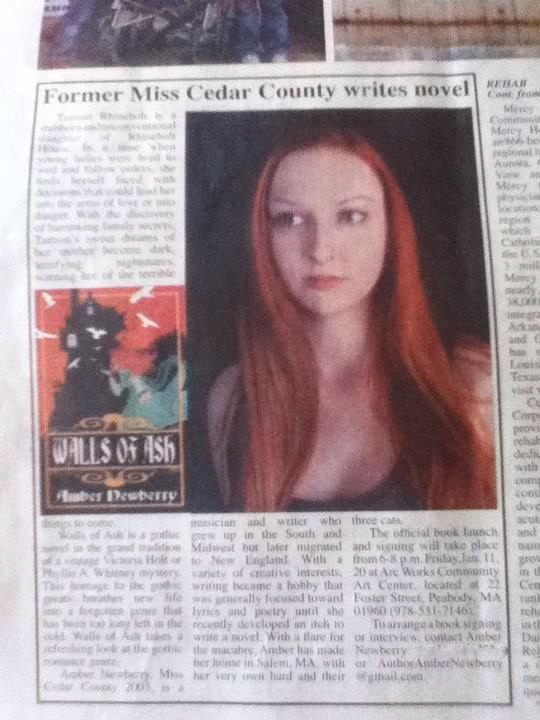 There was a bit of buzz on my Facebook page and then my sister called me to confirm that ‘Walls of Ash’ did, indeed, make it into the paper and I’m looking forward to receiving a copy in the mail in the near future. The sales have been slow to start but are picking up and I am also grateful to have improved momentum with the article in The Sun and the recent addition of the launch event to Art Throb, the North Shore’s art magazine and website. Today was a really wonderful day and 2013 has started off really well for me. So thankful for the people in my life and the continued support of my creative outlet.